The Cleveland Browns have been grabbing their fair share of headlines since the season came to an end. To the shock of, let’s face it, everyone, they’re actually doing so in a good way. New GM John Dorsey has been adding to his front office team, and he’s getting rave reviews for the people he’s acquired. In the past two weeks, Dorsey has made Alonzo Highsmith his new Vice President of Player Personnel, while also hiring Eliot Wolf as Assistant General Manager. Both men are well-respected within the NFL, which led to the Browns receiving notable praise for bringing them in. This, of course, follows the accolades Cleveland was given for hiring Dorsey in the first place. The former Kansas City Chiefs GM is seen by many long-suffering fans as a rare source of hope for this fledgling team. These hires have changed the feeling within the fan-base. People suddenly have hope, as if the team we’re talking about didn’t just complete an entire campaign without a single victory. I certainly understand this, as all three men look to be the foundation of a bright future on paper. Their collective experience implies they could indeed bring success to a franchise unfamiliar with the concept. The odds of this taking place increase provided one simple thing takes place. Jimmy Haslam stays the hell out of the way. Cleveland’s owner has made an epic mess of this team. Unqualified hires, quick firings, shot-gun marriages and seeking advice from anyone he can find are all habits Haslam has displayed since buying the team in 2012. Unsurprisingly, said habits have led to miserable results on the field. Even worse, numerous reports have indicated his management style is a driving factor in the constant chaos within the team facility. Haslam admitted from Day 1 he was a “hands on” owner. As a result, he makes everyone – from front office members to coaches – report to him. To remind you, Haslam has zero experience in helping assemble a winning team. This should help explain how flawed his current strategy is. It’s all topped off with the fact Haslam seemingly seeks out anyone he can for insight, even NFL writers, regurgitating what he hears to his hires as an indication for which direction he wants to go with key decisions. However, his hires have typically been too under-qualified to counter any of his tactics. Now, instead of having an office full of inexperience, he has a very skilled staff on his hands. Make no mistake, Haslam deserves credit for allowing Dorsey to make these acquisitions. The fact this front office is no longer being run by a former lawyer and a baseball executive is quite a step forward. However, this situation can still go off the rails. The most likely source of such a thing taking place is Haslam butting in and trying to run the show. If, despite the fact he’s receiving praise for bringing in highly coveted execs, he still thinks it’s his responsibility to make the final call, I’d like to send Haslam a very clear message. You’ve made great hires, men with legitimate experience at building winning teams. Let them do their jobs. Let them decide what players to go after. Let them develop a draft strategy. More importantly, don’t get over-involved. Don’t add insights to player personnel decisions you’re clearly not qualified to make. Don’t seek outside advice, especially not from media members. If you were to still make such a questionable call, don’t taut it to your new staff as proof you know what you’re doing. If there’s an underlying theme in this, it’s how simple it all is. Haslam finally has a front office full of guys other teams were vying for, men who carry the kind of clout we’ve never seen in Cleveland. They know what they’re doing, and certainly seem capable of finally assembling a talented roster. But they won’t be able to if their boss keeps interfering. They won’t be able to finalize decisions if the owner is still bragging about what Adam Schefter just texted him. 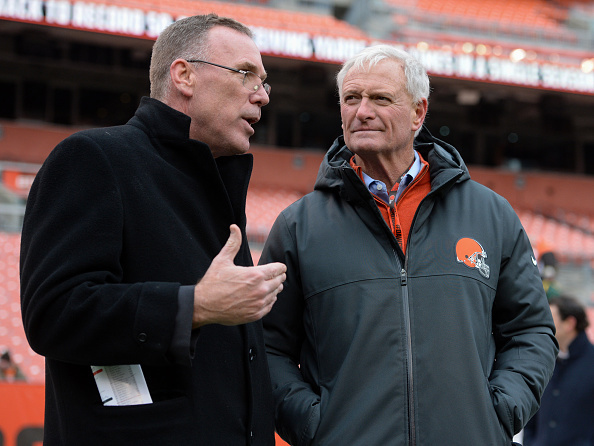 Bottom line – Dorsey, Highsmith and Wolf make up the best front office the Browns have had since the team returned in 1999. Such a thing will all go to waste if Haslam keeps interfering.